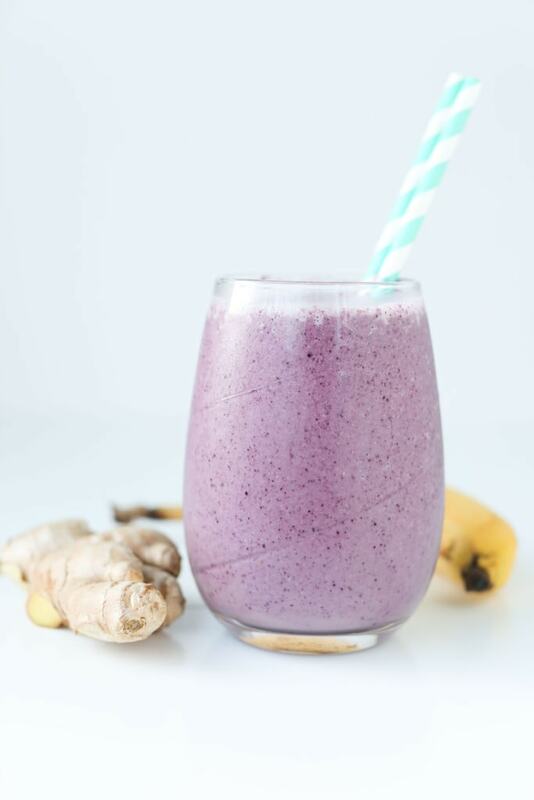 This Post Workout Recovery Smoothie will help your body recover quickly after a tough workout! Happy 2017! Whether working out hard is already part of your regular routine or you’ve resolved to make this your year to get in shape, it’s important to understand how to support your body before, during, and after exercise. What’s the #1 most important thing? Hydration. I had to learn this one the hard way. I recently adding hot yoga to my workout routine. Now, I’m good about drinking enough water most of the time. (Remember the Gallon-a-Day Water Challenge?) But hot yoga brings the need for proper hydration to a whole new level. I was quickly reminded that when you’re doing strenuous exercise where you’re sweating a lot, you need even more water than normal. A few times I headed to my hot yoga class without drinking extra water ahead of time and found out my energy level was low, my muscles wouldn’t perform at their normal level, and by the end of class I was dizzy. Don’t let this happen to you. Make sure you’re hydrating your body before you work out, keep drinking it while you’re working out, and drink even more after your workout. Seem like overkill? It’s not! If you want your body to perform at its highest level, hydration is everything. Let’s talk for a quick minute about types of workouts. If you’re walking while chatting with friends, that’s a totally different type of workout than if you’re doing hot yoga for an hour and a half, or running 12 miles. If you’re working out for over an hour and/or sweating a lot, your body is losing electrolytes through sweat. 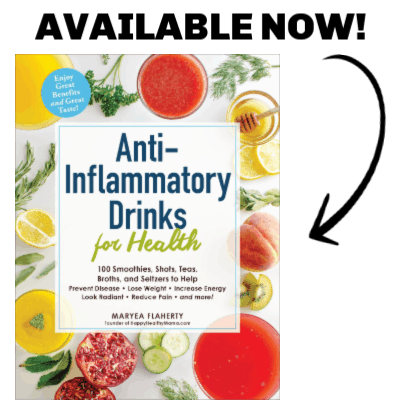 Sports drinks are popular for replenishing electrolytes lost during strenuous exercise, but they are filled with sugar (sometimes in the form of high-fructose corn syrup) and artificial dyes. I’ve got a better option for you. 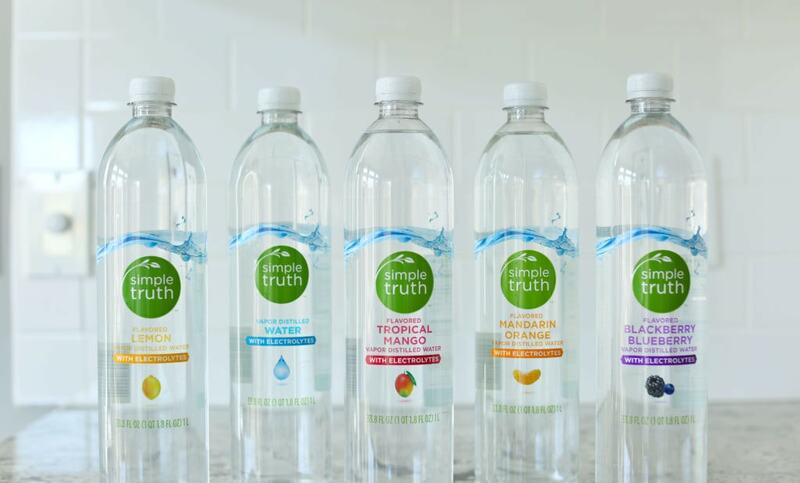 My favorite grocery store brand is Simple Truth (available at Kroger, Fred Meyer, Ralphs, QFC, King Soopers, Frys, Dillons, Bakers, Gerbers, and Smith’s), hands down. They offer a variety of healthy and natural products at affordable prices. They have a water line with electrolytes! It comes in plain or lemon, tropical mango, mandarin orange, and blackberry blueberry. All of them have added electrolytes, so this water is the perfect way to stay hydrated during your tough workouts! And unlike sports drinks, there are no sweeteners, preservatives, carbohydrates or calories. Oh, and I did I mention it costs 1/4 the price of the national brand of electrolyte water?! This is distilled water, so all of the impurities are removed and then electrolytes are added. 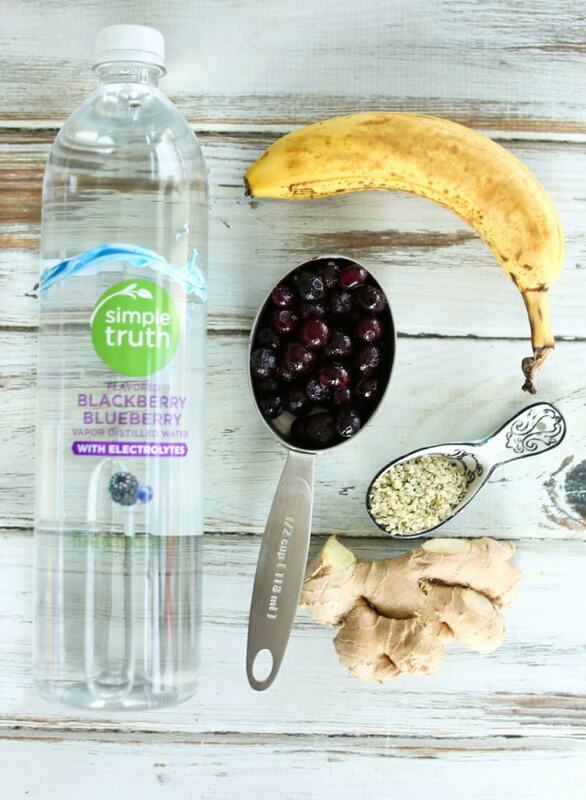 These ingredients work together to make a powerful post-workout recovery smoothie. It’s lightly sweet from the banana, has a little zing from the fresh ginger, and a touch of nuttiness from the hemp seeds. It’s a perfect way to help your body recover from your workout. Getting in a good workout is only part of the healthy equation. Don’t forget to take care of your body with proper hydration! 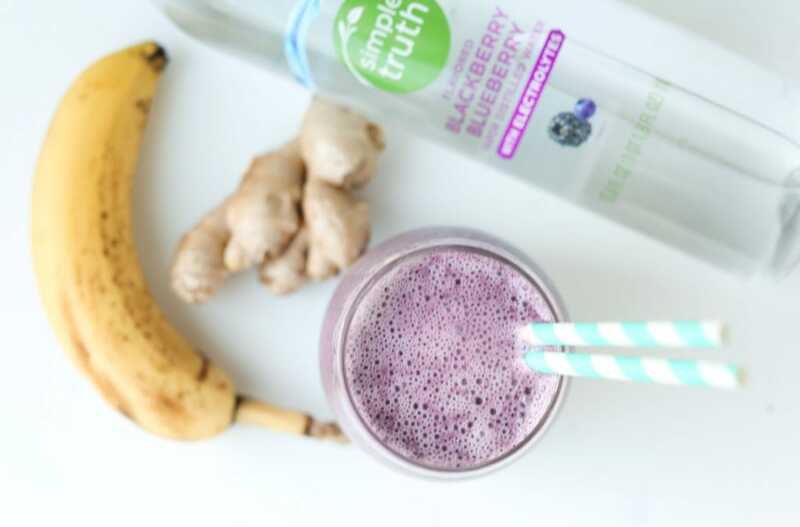 This is a powerful Post-Workout Recovery Smoothie that will help you build muscle, reduce soreness, replace electrolytes, and hydrate after a tough workout! 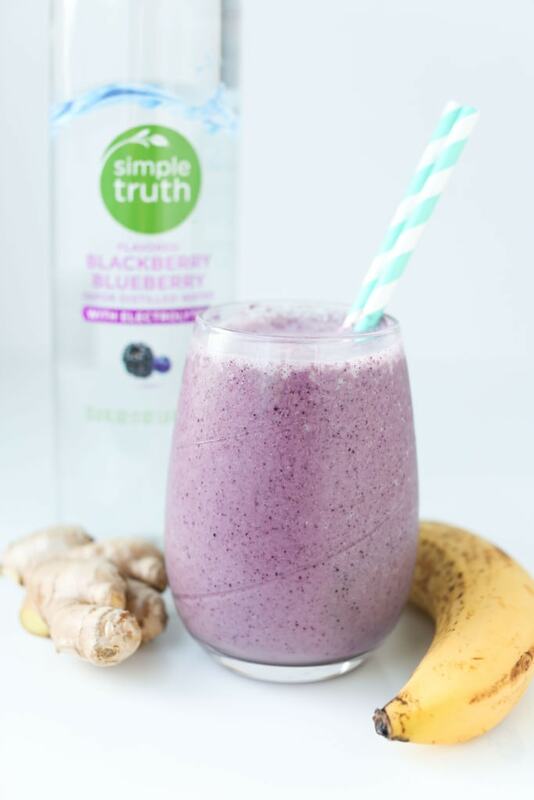 Put all ingredients in a blender and blend until super smooth. Enjoy! Having a smoothie every day is an excellent way to easily eat more fruits and veggies and feel GREAT! Would you like to join a FREE 31 Day Smoothie Challenge? You’ll get 31 different recipes, shopping lists, everything you need to complete the challenge! Click below to get started! I’ll have to check out these waters for my family!! The smoothie sounds refreshing. How do you store ginger? I’ve bought it a few times for smoothies and other recipes which call for a tiny amount. When I need it again it is shriveled up… I had kept it in the crisper drawer of my fridge. After I cut a piece off I put it in a airtight container (usually my small size pyrex container) and keep it in the fridge. It says fresh for a while that way.